Stock status is current as of 4/20/2019 1:12 PMET. 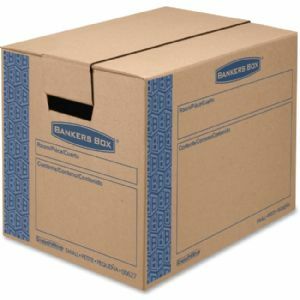 Moving Boxes from Bankers Box offer an innovative design with durable hand holes for comfortable moving and lifting. FastFold One Step Setup and self-locking lid deliver easy, time-saving setup that does not require tape for secure closure. Small box is easy to break down and store flat until ready for reuse. Eco-friendly box is made of material strong 32 ECT C-Flute Kraft corrugated board and contains a high percentage of recycled material.